Created in 1992, the Canadian Chamber of Commerce grew out of a small business club of Canadians who had come to Hungary to seek opportunities presented by the transition of Hungary to a free market system. Since then, the Chamber has grown in step with Hungary’s transition and eventually grew to be among the most respected organizations representing international business interests in Hungary. In 2009 and 2010, our membership has grown and we are proud to welcome Citibank Hungary PLC to the CCCH as members of our new elite patron membership group . Objectives for 2010 include the creation of a closer dialogue between the international Chambers of Commerce in Hungary and taking steps to cooperate on dialogue with the Government of Hungary to adopt critical issues to improve competitiveness and to introduce incentives to adopt more transparent forms of business. As the international economy has impacted Hungary and the region, the Chamber has recognized that it is needed by the community to provide its membership with a channel which targeted audiences, whether government or private businesses, may be reached effectively. Through conferences, seminars and joint initiatives to provide effective business networking, we are already demonstrating that our community is strong and very actively interested in making new business contacts and resolving concerns as well as seeking opportunities through Chamber activities. During our last joint business networking event (Speed Business Meetings), we most recently had nearly 200 participants from four chambers joining in. Working closely with the Canadian Embassy in Budapest, the CCCH has adopted priority areas that are in-line with the Canadian Foreign Trade Policy. These areas include economic sectors, from communications and technology, manufacturing, and agriculture. However, in order to see positive developments here, the CCCH has also added to its priority areas a focus on SMEs and, in 2010, will be rolling out opportunities for local and Canadian companies to find mutual opportunity not only in Hungary, but also in Canada. 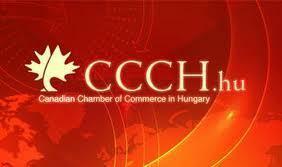 CCCH Mission Statement The Canadian Chamber of Commerce in Hungary promotes profitable and productive relations between Canada and Hungary, and provides value-added services and activities to members combining business interaction, government relations, social networking and community relations, in the true Canadian spirit of fun and enthusiasm.